180g audiophile vinyl! Pressed in Holland! 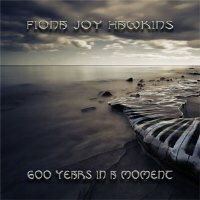 Celtic/New Age pianist, composer and singer Fiona Joy Hawkins celebrates her most epic and significant album, 600 Years In A Moment, now on audiophile-quality vinyl! "I have often wondered how globalization effects music and how history changes our perception of instruments and the musical culture of our ancestors," says Hawkins. She recorded 600 Years In A Moment around the world: Newcastle Australia; Los Angeles; New York; Bremen and Portland, Maine; Halifax, Canada; and Imaginary Road Studios in Vermont. The album was recorded using a contemporary Australian Stuart & Sons piano with ancient instruments from around the world. Hawkins' concept is to bring instruments and their unique sounds from villages across the globe to a modern musical setting to explore those cultures' hidden musical treasures. Contributing artists include Rebecca Daniel (Australian Chamber Orchestra), Eugene Friesen (Paul Winter Consort), Tony Levin (Paul McCartney), Jeff Haynes (Pat Metheney), Heather Rankin (Rankin Family), Marc Shulman (Suzanne Vega), Paul Jarman, Phil Aaberg, Alfredo Rolando Ortiz and many others give the album its historic value and grace. Music samples are available here. The hybrid SACD version is available here.